I was able to catch up on my upcoming design team cards yesterday, so I managed to create a card today to play along with a couple of challenges. 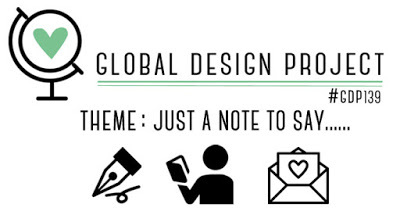 The challenges I’m playing along with are the theme challenge at Global Design Project and the sketch challenge at CAS(E) this Sketch challenge. 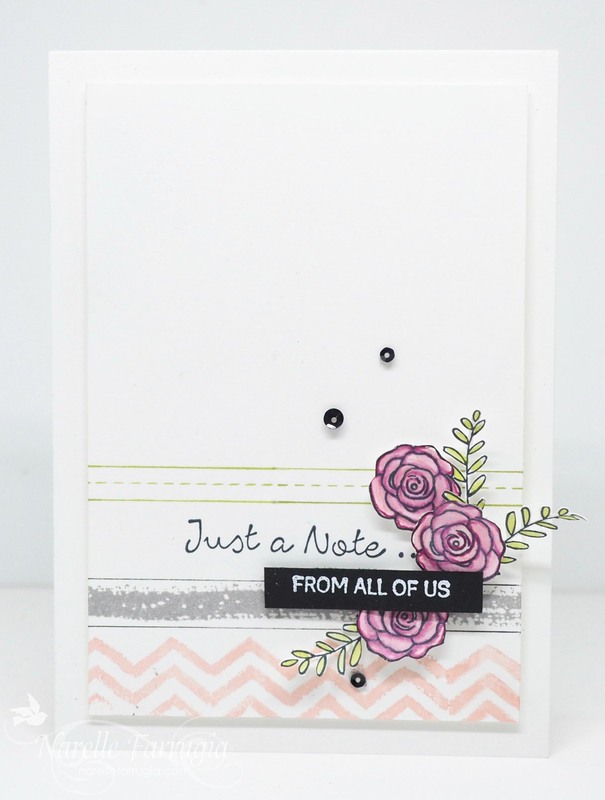 The sentiment I’ve used on my card is from Stampin’ Up!s Better Together. The From All Of Us sentiment is from a set that hasn’t seen ink yet called We Must Celebrate. I heat embossed this in White Embossing Powder on Basic Black Cardstock. The dotted and solid line that I have used is also from Better Together. I stamped this row in Pear Pizzazz Ink. The watercoloured smudge type line and the chevron stamp are from Work of Art. These are stamped in Smoky Slate and Powder Pink Inks. I then took my Black Journal Pen and drew lines on each side of my Smoky Slate smudge. This was going to be a quick and easy card until I decided to fussy the leaves from We Must Celebrate……they’re fiddly little things! I then stamped the flower from Better Together and gave it a watercolour with Sweet Sugarplum Ink. To give the petal definition, I used my Sweet Sugarplum Marker around each of the petal lines. As I always seem to do, I finished off my card by adding three black sequins. Oh I love a sketch challenge! I’ve probably said this before, but they are truly my favourite! The cool sketch this week at Freshly Made Sketches has been designed by the seriously talented Cecile Ribon. 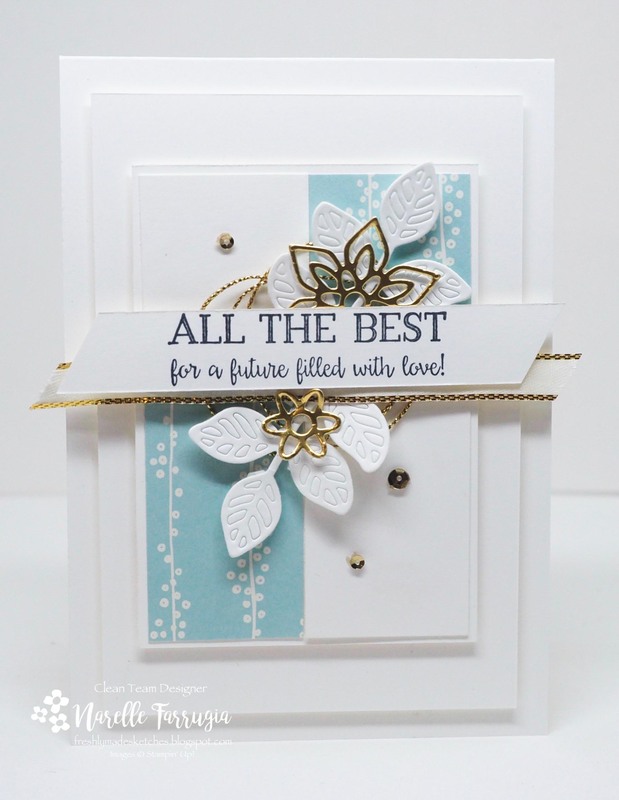 The die I’ve used in the background on my card is from Flourish Thinlits Dies. I’ve used Smoky Slate for these lattice type dies. The pretty little flowers I watercoloured are from Better Together. I’ve coloured them in a combination of pinks – Blushing Bride and Melon Mambo. The leaves, that you can probably tell are my favourite at the moment, are from Petal Palette. I’ve stamped them in Pear Pizzazz and then fussy cut them out. To add a little bit of interest to the background, I stamped the ink splatters from Swirly Bird in the combination of Blushing Bride and Melon Mambo Inks. The sentiment I’ve used is stamped in Black Archival Ink is also from Better Together. 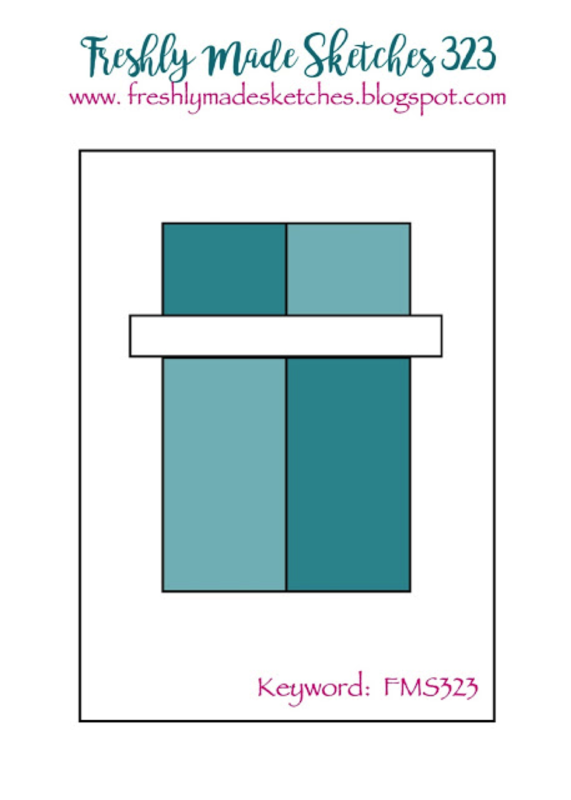 As you can see, by using this sentiment, I’ve created another wedding card for my collection. Think I have a total of two now…. Our Clean Team have created gorgeous cards with Cecile’s sketch. Head over to the challenge and take a look. While you’re there you will see we have a new GD playing along with us this month – the uber talented Tracey Mehak McNeely! It’s so exciting to have her on the team! There’s a new sketch challenge at Freshly Made Sketches. 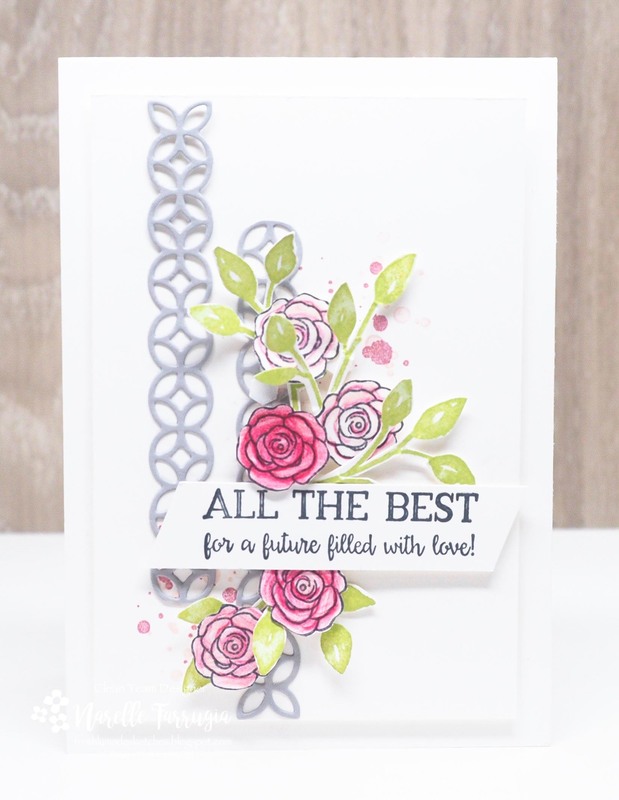 Our sketch is a fabulous one and has been designed by Karren Johnson – our super creative Kiwi friend who makes stunning cards with amazing background and stunning details. I’m going to make a trip over the seas in-between our countries and touch all the stuff in her craft room one day – she just doesn’t know it yet! This card started as baby card and somehow ended up as a wedding card. Funny how that happens! 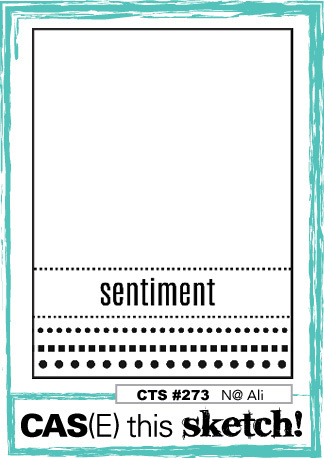 The designer series paper strips I’ve used are from Stampin’ Up!s Bundle of Love Specialty Designer Series Paper. My white leaves and gold flowers are cut on my big shot with Flourish Thinlits Dies. 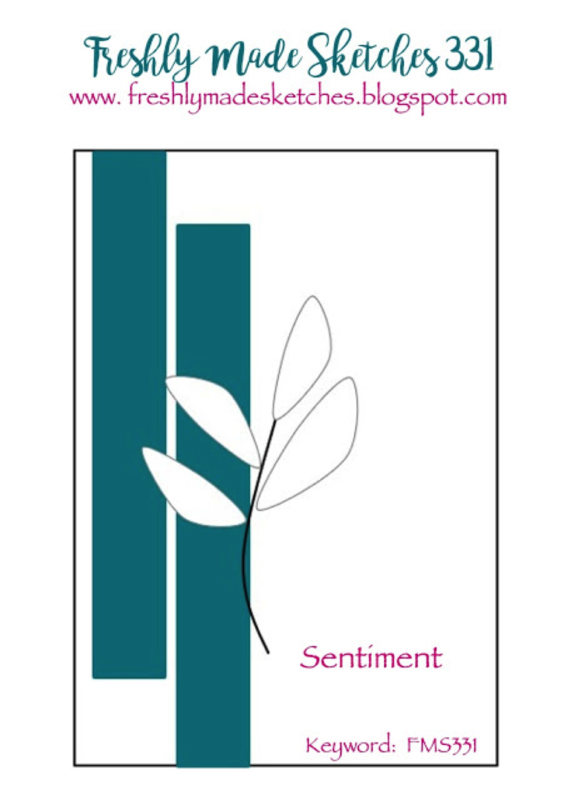 The sentiment is one that I haven’t used on any of my cards yet – so I wanted to give it some ink today. This great sentiment is from Better Together. 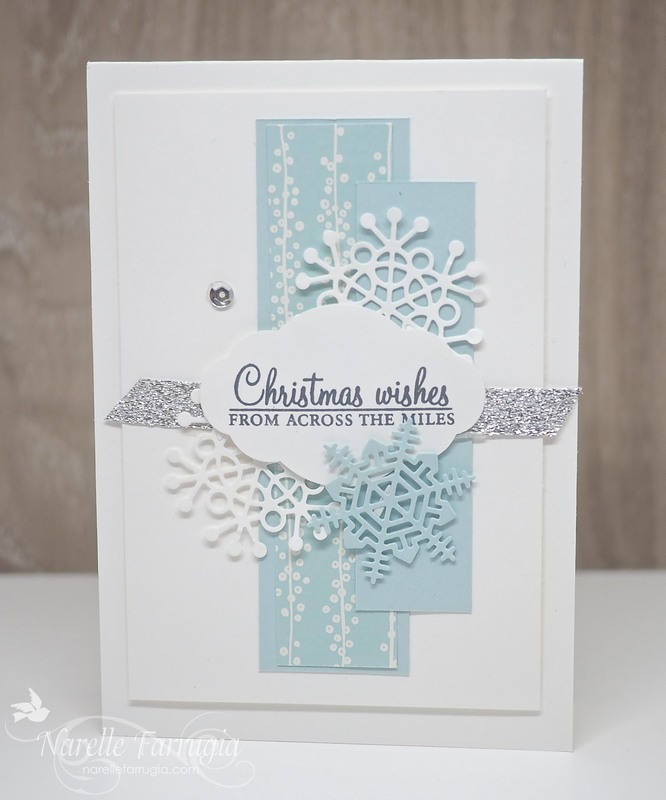 The team will inspire you with their gorgeous cards. Make sure you head over to Freshly Made Sketches and take a look. I LOVE Christmas time and I LOVE my Christmas classes. While I was on holidays recently I made the following projects for my class girls. There’s quite an overload of photos, so I hope you’re ready for them! Stampin’ Up! Pizza Boxes are the coolest and most easiest boxes to put together. We made 4 simple gift cards to put in the boxes to give to someone as a gift. 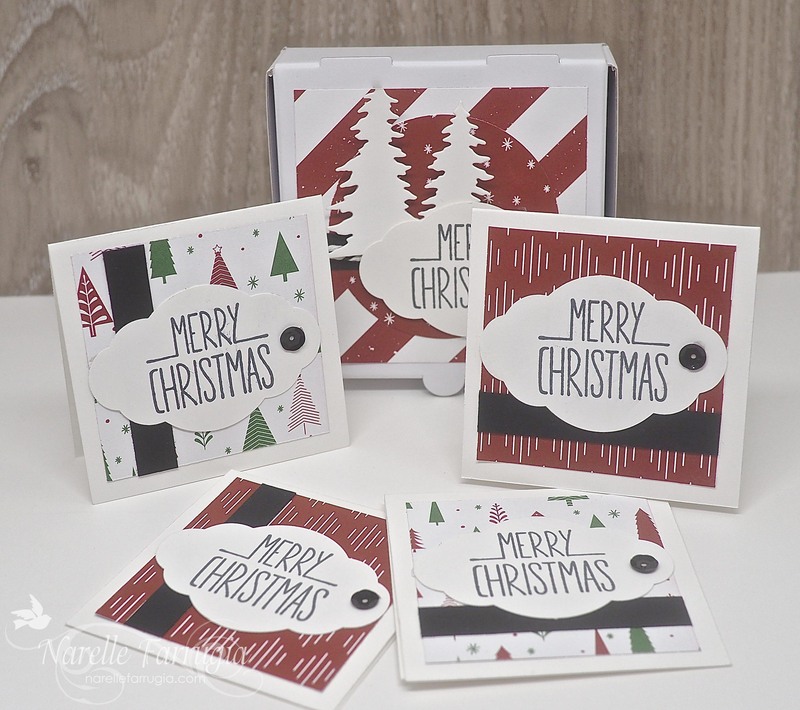 The designer series paper I’ve used is from Be Merry Designer Series Paper. I’ve added a thin strip of Basic Black cardstock on the front the gift cards and box. The sentiment is from Better Together and I’ve punched them out with my Pretty Label Punch. To add a little bling (but not too much, as not everyone keeps handmade cards) we added a black sequin. For the front of the Pizza Box, I cut some white trees cut with my Card Front Builder Thinlits Dies. For a different look, some of the girls cut Old Olive trees – both looked fabulous I have to say. I also added a strip of Basic Black cardstock and some Black Bakers Twine. Oh and as always, a black sequin. 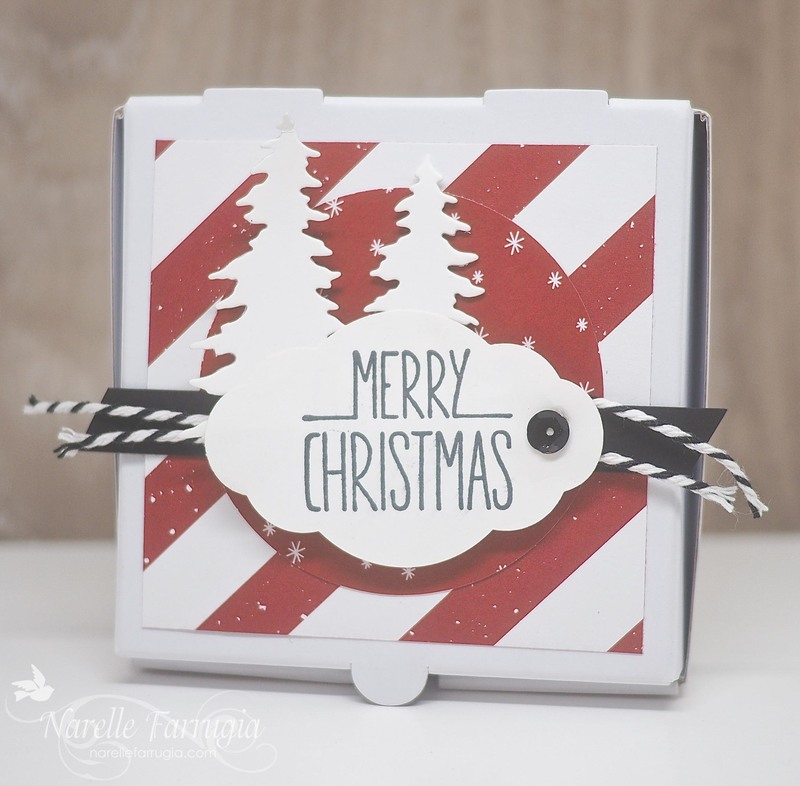 We also made two simple cards using the same designer series paper we used on the Pizza Box and gift cards. 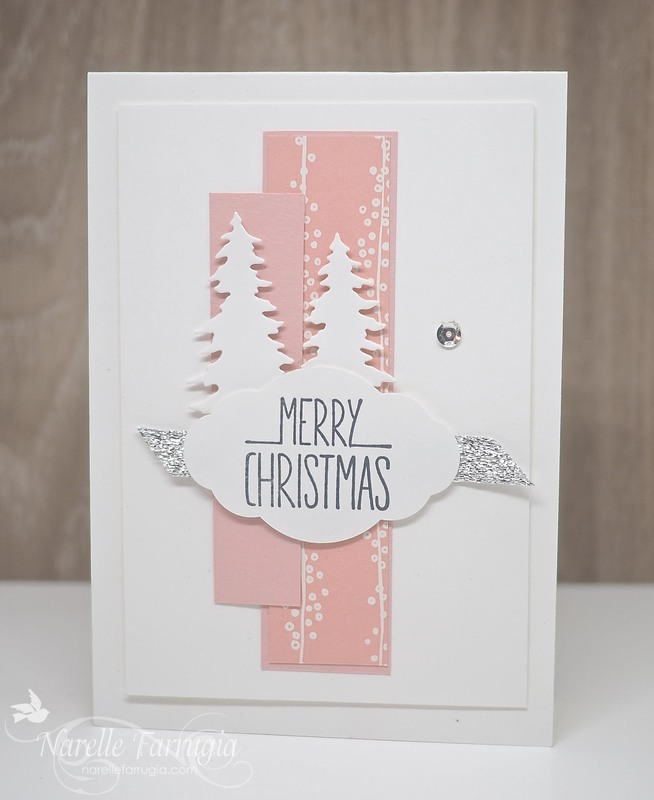 My first card uses a strip of DSP from Be Merry Designer Series Paper on the side of my card. I added some Old Olive trees that were cut with my Card Front Builder Thinlits Dies. I then cut the sentiment with my retired Wonderful Wreath Framelits Dies. 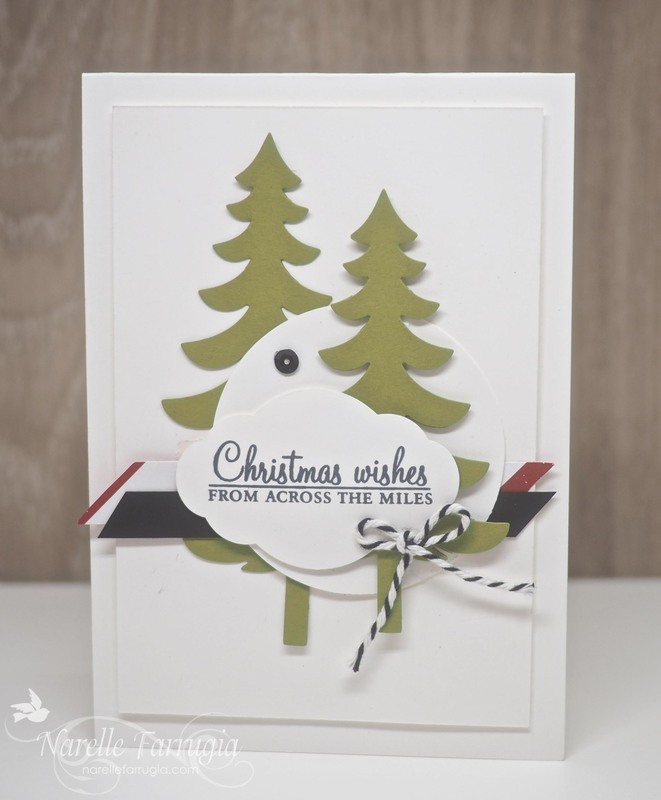 For our second card, I layered Old Olive trees cut with my Santa Sleigh Framelits Die, a circle, a Pretty Label Punch with a sentiment from Holly Berry Happiness. To tie in with the other card I used a strip of DSP, Basic Black cardstock and Black Bakers Twine. A simple black sequin finishes this card off. You will probably remember this card I made for our 300th sketch challenge at Freshly Made Sketches. I love this card and I think the girls did too! I think Bundle of Love Speciality Designer Series Paper works really well for Christmas and for our class, I also made a pink one below, to show that Christmas doesn’t always need to be red and green. 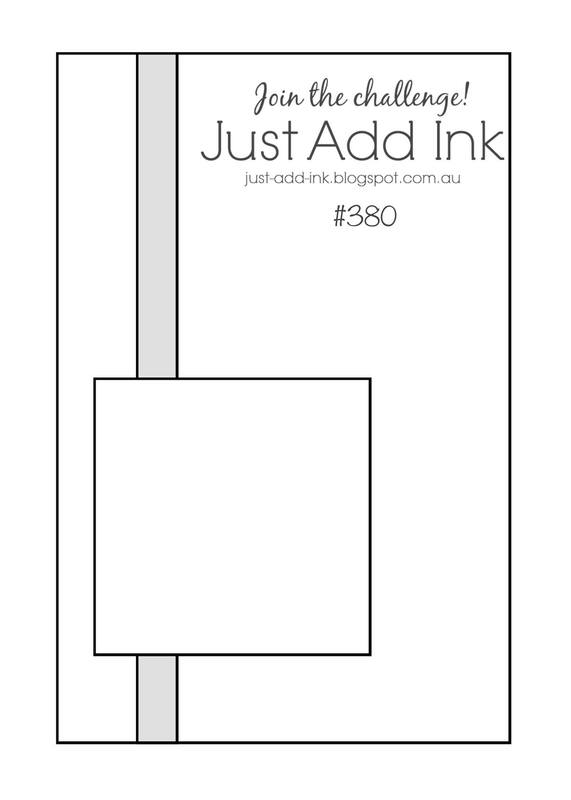 We have a new challenge at Just Add Ink for you. This week the sketch has been designed by me. I’ve created a simple sketch that can be interpreted in so many different ways. 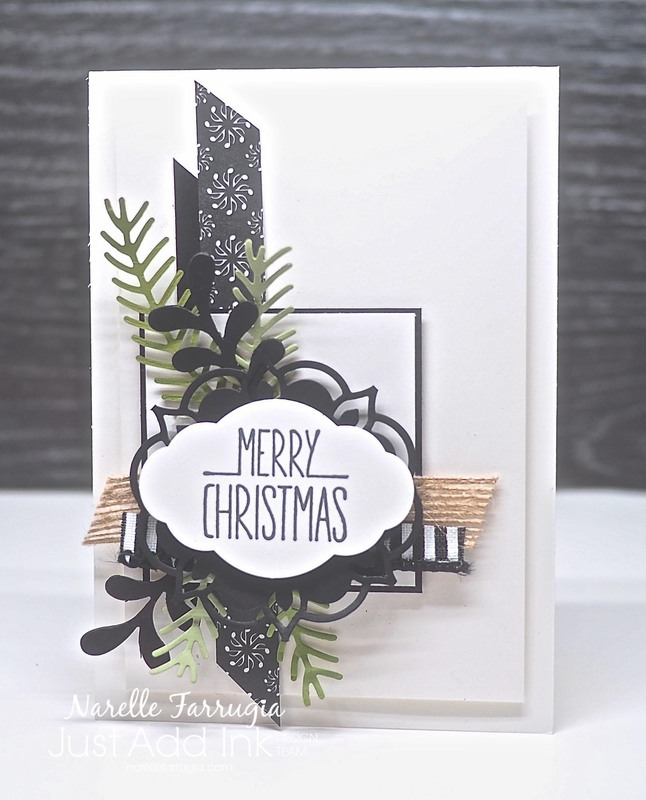 I really love non-traditional colours for Christmas cards and I really love featuring black on them. The only stamping I did on this card is the sentiment. This Christmas sentiment is a new favourite of mine. It’s from a Stampin’ Up stamp set called Better Together. 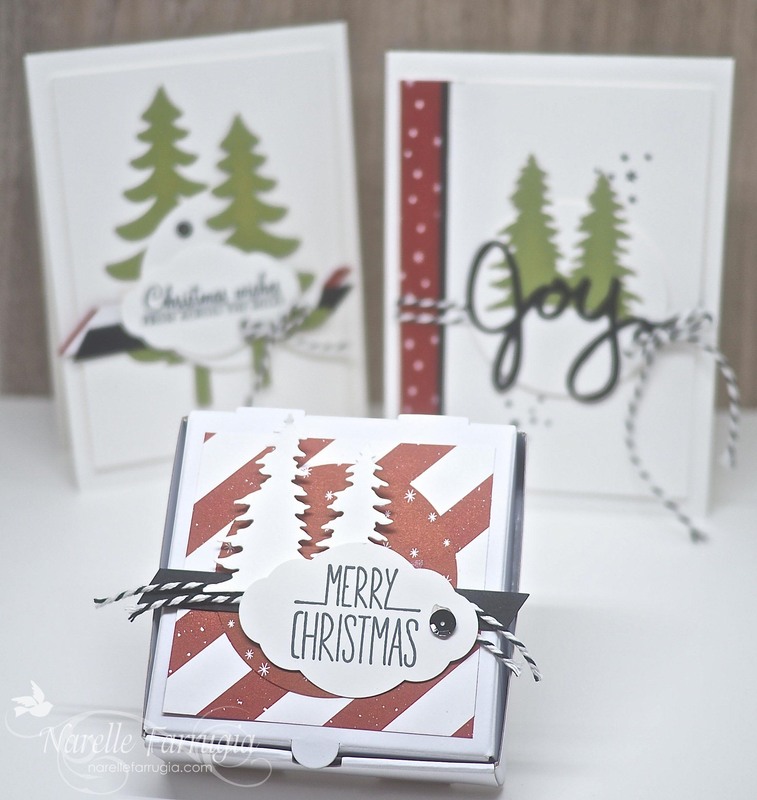 The pine boughs I added for layering are cut with my Pretty Pines Thinlits Dies. To create a border around my sentiment (that was punched with my Pretty Label Punch), I used a die from Eastern Medallions Thinlits Dies. As I wanted to create more of a oval shape to frame the sentiment, I cut the diecut through the centre and overlapped it under the sentiment. I then layered some Burlap Ribbon and a half strip of this gorgeous Striped Ribbon as I had them both sitting unused on my desk. The strip of designer series paper was also sitting unused on my desk. 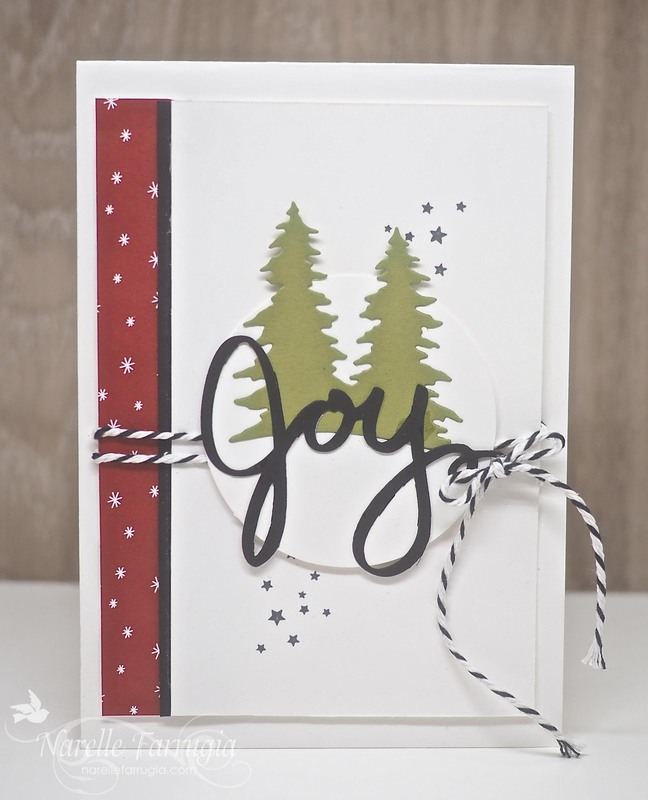 This pretty paper is from Merry Music Specialty Designer Series Paper. I always love it when I can use up discarded products laying around on my desk. It kind of makes me feel like I’m getting somewhere on cleaning up my desk! The girls in the design team have created gorgeous cards to inspire you. Head over to the challenge and take a look at their creations. We would love it if you could play along with this sketch challenge.